(See also: the Interview with Monk Turner, his official website and musical blog. All songs are free to download and a playlist of most of the songs mentioned in this essay follows at the bottom). I have a serious medical condition and only have minutes to live. However, could you please write a song about a clown riding a unicycle powered exclusively by hate? He’d probably have a fish down his or her pants and should be assaulting people with Seltzer or pies. The clown also needs to go on a retard adventure in which he finds something of importance … a sock — a missing TV remote, God, etc. I know only you could craft such a masterpiece…. (for the Song “Clown”). I’ve been thinking lately about macaroni and cheese from a box. It’s a silly thing really and pitted against most laws of nature even the lovely organic white cheddar cheese kind with shells. But I miss it. It doesn’t exist in Ireland — not even the neon tangerine-colored Kraft kind. I thought you might oblige me and write a song about a girl who misses mac and cheese and the length she is willing to go for it. You might resort to violence, but please avoid reference to white chocolate and Nicolas Cage (as both are heinous). I miss my Wilco double album, so if you could write in the style of Wilco under the influence of Nina Simone… (for the song “Macaroni”). Impossible, you say? L.A. songwriter and concept album creator Monk Turner enjoys such challenges. He wanted to make an album called Taking Requests (2007) and asked various people to suggest ideas for songs. Then he wrote them. It’s one of those madcap challenges that only a lunatic could accept; the results are inventive and fun. One DJ suggested that Monk write a song about “his nuts,” so Monk wrote a song called Nuts – the legume kind. I don’t regard Taking Requests as the most notable of Monk Turner’s concept albums (Emergency and Love Story are much more interesting and important). But Taking Requests show the range of Turner’s gifts and the adaptability of his muse to different musical styles. Not all of the songs are brilliant, but some are (Clown is written in a swaying mock-melodramatic fashion, and Macaroni is a brilliant joke song written in a plaintive tone). Purely from a creative point of view, it is fascinating to see how Turner incorporates parts of the request into the song and which musical style he uses. Some use jazzy styles and Overheard in NY turns a series of randomly-heard phrases from subway rides (“Those shorts are chronic” “This isn’t my stuff,” “ That’s it — tomorrow, you’re moving to Egypt” “I can’t get the taste of rubber out my mouth”) into a electronic sound poem. The result is not only funny and hypnotizing, but the chugging style seems reminiscent of the ambient creaks of transit machinery. (I am typing this on a Houston bus and I can attest that mass transit provides an interesting jukebox of hums and rhythms and creaks). Monk Turner has been creating these kinds of concept albums under creative commons licenses for the last decade now.Despite his unerring ability to write catchy Devo-esque songs like Take Your Vitamin and Company Toad, at about 2006 Turner began to emphasize albums over songs. He dubbed himself “Galactic Defender of the Concept Album.’ His New American Songbook (2006) has a mix of messages and styles ranging from the traditional folk song (I was Born an American) to political fable (Young Politician Who was going to make a change) to upbeat post-consumerism (We’re Going to Take Back America). A little less 1984, A little more 1964 is a fascinating mélange which is really a homage to the sixties both philosophically and stylistically, with reggae beat, electronic sampling and lots of psychedelic effects (reminiscent of Overheard in New York). The lyrics explicitly use the language of protest (revolution, demonstrate, motivate), but in fact the words remain subordinate to the bopping rhythm, and almost sounds muted (a kind of acknowledgement of how distant the 60s spirit feels to us today). Shh the American Dream is Sleeping is a hazy mock-lullaby to a country dazed by its ideals. All American Hippie Girl is a delightful satirical song that tells the story of a boy in love with a “hippie girl” who is talking about political causes but never gives him attention. She invited me to a protest, and I said, I’d rather not go. Besides being clever and hummable, this song comes with trademark kazoo choruses, slow moments, simple guitar accompaniment plus subtle musical sampling to punctuate the song. Overall, the album has great ambitions; one has to welcome the audacity of trying to write an album about a thing called “America” in an age of 500 cable channels, political polarizations, and cocooned suburban consciousness. Back in the days of Woody Guthrie, I think everyone knew what America was. Now…I am not so sure. In 2008 Monk Turner released two more albums Calendar and Love Story. Calendar is a grab bag of 12 songs inspired loosely by each month of the year. Sometimes the link is tenuous; the August song Agustus is more about the Roman emperor than the month while the fun and joyous “March in March” is more about marching than the eponymous month. On the other hand, two of the more successful songs, Halloween Night and Turkey Time follow the assignment more literally. Turkey Time is a rapid funk rock celebration of the holiday a la Lenny Kravitz; Halloween Night has the campy spookiness of a haunted house, replete with sound effects and dramatic flourishes. Imagine stripping out the vocals from Halloween Night, and you’ll find that the instrumental part still has a magical, sparkling quality which embodies the adolescent Halloween spirit. 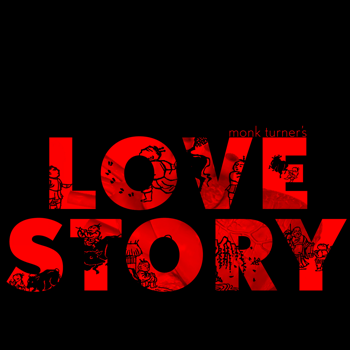 All the songs on Love Story are great and provide unexpected pleasures. This definitely ranks as my favorite album of the bunch. ’cause this town belongs to us. from the song New Downtown in Coordinates. Perhaps the most interesting about the album are the musical arrangements. The reverberating effects in the slow and eerie Trapped in My Head are something you’d find in the next David Lynch movie. First and Central has some radical Nu Jazz saxophone improvisations by Chad Bloom. The slow ballad Rooftop Balcony compliments Rasmussen’s lovely voice. Even Michael Jackson’s grave has the campy theatrical feel of 1980s pop – as fitting a tribute as any to the pop star. The 2011 album Emergency Songs is the latest and greatest; it’s beautifully polished and unlike Love Songs – where a lot of songs can stand out on their own — you really have to listen to the whole album from start to finish to appreciate the album as a whole. Turner says that Alanna Lin cowrote all the songs on the album; as a vocalist, Lin has a slow, understated way of singing even in the fast jazzy numbers; but her voice has enough range to handle the agitated pace of a rock song like Hold On or Where’s My Horse, the cheerful irony of After Disaster, the jazzy hipness of Trust is Just a Word and the solemnness of O Say Can You See the Future. For several of the songs (Letter to Los Angeleans and Lover Won’t You Hold Me) the musical arrangement is so minimal that it almost feels like Lin is singing a capella (though the gentle guitar strums in Lover Won’t You Hold Me provide a tenderness befitting the song’s subject). Musically, there’s a lot of interesting things going on in this album – pauses, sound effects, abrupt transitions, jazzy piano and sax, crescendos, choruses and a variety of musical styles – even a dollop of country rock. and never saw the pain. After disaster, it’s not the same. There are comic interludes; Prisoner tells the story of a convicted murderer on his way to prison who manages to escape when the bus crashes after an earthquake. But Prisoner is a slow almost plaintive song, as though the prisoner is more shaken than elated at this strange twist of fate. All the songs are thought-provoking and ironic, especially O Say Can You See the Future (probably the most amazing track on the album) which meditates about life and its desolations. This otherworldly song is slow and eerie and beautifully arranged; in the middle the song crashes into something (but what? that is the question); by the end the flute gently picks the listener up and deposits him in some safe and peaceful place. I can’t help but be struck at the title which combines the first line of the US National Anthem with a question about fate and the possibility of annihilation. So Monk Turner’s albums have progressed from songs about nuts and macaroni to meditations about life itself. Ironically, the Emergency Album seems not only to be the most fully realized of Monk Turner’s concept album, it also was the most collaborative; in fact, as a creative commons masterpiece, it is likely to be weaved by others into future music fabrics. In an allegedly meaningless world torn apart by all kinds of things, it is reassuring to know that there is still enough collective energy and enthusiasm to bring about such a profound and unsettling album. Nov 8 2012 Update. Here’s my review of his latest album project Kaleidoscope.